South Gloucestershire’s Discover Festival is well underway with a variety of activities to enjoy this weekend from traditional orchard events in the countryside to designing games using cutting edge technology. Abbotswood’s Autumn Apple Day takes place on Saturday 1 October, from 11am to 3pm, at the green space near the St Nicholas’ Centre, Chargrove, Yate (free entry). This annual community celebration of all things autumnal offers a chance to try apple bobbing and other games, music, food and educational activities and crafts. The event is for people of all ages to enjoy. Grimsbury Farm has a special apple celebration weekend with ‘Big Apple Days’ taking place on both Saturday 1 and Sunday 2 October (free entry). On Saturday from 10am to 1pm, visitors will pick apples at a private orchard (please book by emailing chairman@fogf.co.uk). On Sunday from 11am to 4pm, visitors can help press apples and learn how to make fresh apple juice. Winterbourne Medieval Barn has an Orchard Harvest Day on Sunday 2 October, starting at 11am (adults £2, children under 16 free). 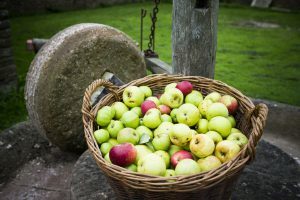 Celebrate and discover the bounty of local orchards, locally-produced food and drink, together with displays of crafts and rural skills at Winterbourne’s Medieval Barn. Come and see traditional cider making using a Victorian stone apple mill and taste the results. There will also be a variety of children’s activities to choose from. 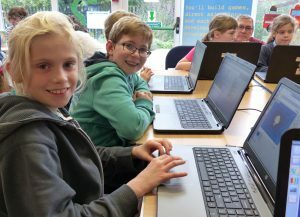 Making games in Scratch (age 8+, free entry) at Staple Hill Library, Thursday 29 September, 6pm to 7pm and at Downend Library, Saturday 1 October, 2.30pm to 3.30pm. Using the drag and drop code of Scratch, visitors will build their own games. Suitable for beginners or existing Scratch users, these sessions will provide an opportunity to develop new skills and try out some ideas. Code your own games inside Minecraft, Emersons Green Library, 1 October at 10am (age 14+ and entry is free). Working on the Raspberry Pi and coding in Python, visitors will take over Minecraft to create their own games. Three separate games build on each other and provide the foundation to a world of game creation. Sports gear, smart cars and stealth bombers; the cutting-edge world of composite materials, Emersons Green Library, Thursday 29 September at 8pm (suitable for all ages, free entry). Nigel Keen from the Composites Centre in Emersons Green will amaze visitors with the science behind everyday objects that we take for granted. These are just a small selection of hundreds of opportunities to discover something new in South Gloucestershire during the festival which runs throughout September and October. Now in its fifth year, the Discover Festival offers a unique opportunity for residents to find out what makes South Gloucestershire a great place to live and work, with a showcase of local groups, events and places, many of which you can enjoy all year round.